Is ‘tech furniture’ the way forward? Sadly, the Piano Computer's keys all seem to be of the QWERTY variety. There's nothing like a concept product to get MusicRadar's juices flowing, particularly if it's one of a technological nature. 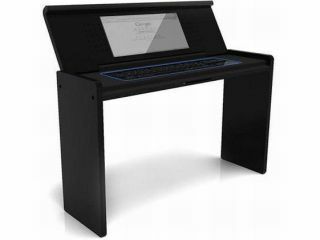 The Piano Computer is pretty much as its name and the picture suggest: a computer that looks like a piano. We don't have any proper specs to go on, but presumably, the lid folds down so that the unit can then serve as a standard table/desk. We're guessing that all the requisite cabling is hidden away beneath the case, though some connectivity must surely be lurking on the back panel. The irony, of course, is that if you were a keyboard player who wanted to use the Piano Computer as a music-making device, you'd have to buy a MIDI controller to sit in front of it. Still, it's a nice idea - whether it'll ever be anything more than that we're not sure.